The Alexander Arms Ulfberht is a potent tool for long-range shooters that is capable of excellent accuracy, particularly as distances stretch. According to ancient Norse history, a unique type of sword made of uncommonly strong and durable steel was produced during the Viking Age between the 9th and 11th centuries; the swords were engraved with the name “Ulfberht” and were regarded as some of the finest steel weapons of the time. It was the time of the Dark Ages, and weapons evolved, but today’s raider still relies on the same stealth, swiftness and force. There is a reason Alexander Arms chose to call its .338 Lapua Magnum rifle the Ulfberht. The name is appropriate because this semi-automatic rifle is capable of repeatedly hitting out to 1,000 yards or more with velocity and energy that only the .338 Lapua can generate. The hammer of Thor from afar. When you speak with Bill Alexander, you immediately get the sense he is a student of the gun. “I learn something new every day about our guns,” Alexander said. “Because no testing can conclusively create the environment the weapon will be used. I’ve been building these rifles for six years, and the design is ever evolving.” As we talk, Alexander pulls me into his world and the world of the Ulfberht and the .338 Lapua Magnum. This world of big-bore, long-range rifles is one filled with managing details—too fast a rifling, too slow rifling, the cut of rifling, consistency of ammunition, managing recoil—and channeling the power of the caliber to do what you want it to, which is hitting relatively small targets at long distances. The Ulfberht design is based on the old Soviet Degtyaryov machine gun, also know as the DP-28 light machine gun, which fired the 7.62x54mmR cartridge and was in use with the Soviet military from 1928 through the 1960s. The Ulfberht, like the DP-28, uses a gas piston system, but Alexander Arms flipped the operating system so the gas piston is above the barrel, similar to the current RPD machine gun. Alexander modified the gas system, allowing the user to operate the rifle in hot and cold environments and with a variety of .338 Lapua ammunition types, including with suppressed fire. The gas regulator tube adjusts with four possible options. To adjust, loosen the cylinder nut at the front of the gas block, and then relieve the tension on the tube by slightly pulling back the charging handle. You can then rotate the gas regulator and re-tighten the index pin once the desired gas setting is achieved. The bolt speed and angle of ejected cases is an indication of too much or too little gas. If the bolt speed is too slow, cases will eject toward the back of the rifle; too fast and they eject forward. Ideally, cases should eject perpendicular or straight out of the ejection port. The .338 Lapua generates a lot of pressure, about 61,000 PSI. This also helps to keep the receiver thin, not that the Ulfberht is lithe. Unloaded it weighs close to 20 pounds sans scope, bipod and loaded magazine. This is a heavyweight rifle designed to shoot with a bipod. Trust me, the weight is a bonus with the .338 Lapua. Lots of steel is needed to support the 27.5-inch barrel and contain the power of the cartridge. The BCG (Bolt Carrier Group) uses two steel flaps located on the left and right sides of the BCG. The bolt handle is round and knurled, so it has plenty of texture and rolls off your fingers’ tips when manipulated. The action is quite smooth. Unique to the Ulfberht is the ejection port, which is under the operating handle. The port allows the operator to load a single round. The receiver is constructed of forged 9310 steel alloy with the barrel made of 4150 chrome-moly. It has a 1:9.3-inch twist rate. The deep grooves help resist fouling and keep the rifle running and accurate. A three-prong flash hider is screwed onto the muzzle, and the M18x1.5 threading allows use of other muzzle devices including cans. A 30 MOA Picatinny rail is topside, offering the user plenty of room and elevation for mounting a high-power scope and other optic accessories for long distance work. The handguard is made of aluminum and vented to assist cooling. Screw holes are placed in the 3, 6, and 9 o‘clock positions so users can mount accessories and a bipod. You will need a bipod for the Ulfberht, one that is well constructed. An Ergo Deluxe pistol grip is fitted to the receiver, which is also equipped with a Geissele Automatics SSA two-stage trigger. The pull weight averaged at 4.5 pounds. At the aft end is a Magpul PRS adjustable rifle stock. The stock has an adjustable cheek riser and LOP. The stock also folds to the right side of the receiver. The weapon can be operated with the stock in the folded position. It rapidly deploys or stows with the press of a button, locking the stock in the folded or extended position. This feature enables this massive rifle to be more compact and more easily transported. A polymer magazine with a 10-round capacity feeds the Ulfberht. The magazines are close fitting and with no doubt extended use will wear the polymer so the magazines fall free. An AK-style magazine release is located in front of the trigger guard. Magazines load similar to AR-style magazines, straight up the mag well. Because the Ulfberht is serious firepower, I acquired some serious glass from Meopta. The ZD 6-24x56mm RD is specifically designed for long range. The illuminated Mil Dot 2 reticle has an integrated range finder and is calibrated for tactical calibers like 7.62×51 NATO/.308 Win., .338 Win. Mag. and .50 BMG/12.7x99mm NATO. Serious glass for a serious rifle. The scope features fast eye focus and MeoTrak II finger adjustable windage and elevation turrets. One click equals .25 MOA. Clicks are tactile and audible, and zeroing was especially easy. I used a Leupold MK2 Integral Mounting Systems (IMS) one-piece base, which gave me enough height to clear the Meopta’s 56mm objective. In hindsight—no pun intended—the Leupold set worked on the Ulfberht, but the mount is meant for AR-style rifles and was all I had on hand. In the future, I’ll use two rings spaced farther apart along the Meopta’s tube. Shooting a .338 Lapua is not like shooting a .308 Win. or even a .300 Win. Mag. Lapuas like the Ulfberht are large rifles and require appropriate gear such as a sturdy bipod (Alexander prefers Atlas bipods), a tough scope like the Meopta that can cope with recoil with mounts that are just as capable, and a shooting bag to place under the toe of the stock to achieve a steady, effortless aim. Frontline Defense (FrontlineDefenseUSA.com) is located in Warrenton, North Carolina, and it’s a top-notch facility offering handgun and rifle/carbine training. They also have a 1,000-yard range. Serious rifle, serious glass, serious yardage. Long-range shooting instructor and owner of Frontline Defense, Paul Smith called corrections and the Meopta and Ulfberht were beginning to run in sync. Smith is a Distinguished Honor Graduate of the U.S. Army Sniper School. 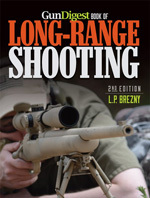 His real-world training and insights make him a valuable resource to those shooting long. The last bit, to use one of Bill Alexander’s English expressions, was Bill Alexander himself. Bill offered to meet us at the Frontline Defense facility to wring out the Ulfberht. Bill brought with him some R&D prototype rifles, the next evolution of the Ulfberht. He also showed up with a bucket of Hornady ammo. With ammo prices at about $6 a round, I had a hard time scrounging up a few boxes of ammo. The .338 Lapua Magnum cartridge itself has been going through some growing pains. Initially, only Lapua produced ammo, but as the interest in long-range shooting has increased, other ammunition manufacturers are producing the round. As Bill showed us, there are differences in the extractor groove and rim of cases from two different manufacturers. These differences in case dimensions, let alone changes in powder—yes, they are loaded to the same velocity, but the way the powder burns and fouling may be very different—will effect any .338 Lapua rifle shooter. In fact, I experienced some issues with ammo, which I compounded by adjusting the gas tube. Bill quickly tore down the rifle and cleaned it. That is exactly what happened at 100 yards when I fired the first magazine of a newly cleaned bore and gas tube. The rifle needed those two fouling shots and then settled down to sub-MOA 3-shot groups. Any flyers were my own fault. Paul and Bill also grouped rounds similarly well and better. Bill showed off his R&D rifles. Internally, the extractor on the next generation has been redesigned to compensate for the differences in brass cases; the piston head is more like an AK-74 position; the gas tube can be removed with a cartridge case; the tube itself has 12 gas settings; the recoil spring is stiffer; and there are more changes. The evolution of the Ulfberht is ongoing, and Alexander Arms will eventually have retrofit kits available to owners of older generation rifles. We fired an Ulfberht with a muzzle brake, and the reduction in recoil was evident compared to the rifle with a three-prong flash hider. The third rifle Bill was touting was equipped with a carbon fiber handguard and the barrel was relieved of metal in circular cuts. The cuts in the barrel reduced overall weight by two ounces. The third variant was also equipped with a suppressor. The difference between shooting a .338 Lapua with a flash hider and compensated can be judged by the differences in felt recoil. The compensator greatly reduced recoil. The Ulfberht has more of push in the shoulder rather than a jolt. It is quite manageable if you are accustomed to larger calibers. The 1,000-yard range is a platform that looks out at targets starting at 300 yards out to 1,000 yards with targets at 100-yard increments. With the naked eye, you can barely see the white steel plate at 1,000 yards, and that target measures 18×30 inches. Temperature was 87 degrees with a left-to-right wind of 5 mph according to the Kestrel. Paul adjusted for elevation and held into the wind with the comped rifle. First shot was dead on at elevation off by about 6 inches. Adjust, breathe, fire. When shooting long range at steel, there is that perceptible lag after the sound of the shot and the sound of lead hitting steel. In the spotting scope, the white steel target danced. The next three rounds continued to hit steel. I was on deck and -took direction from Paul acting as spotter. Miss. Correction. Lead on steel. I continued to hit steel until the magazine was empty. The Ulfberht shows its trueness at distance. The 100-yard sub-MOA group is pretty to look at, but the reality is that a cartridge like the .338 Lapua is built for the long game, and the ability to hammer steel at 1,000 yards in fast, successive fire is the Ulfberht’s sweet spot. For more information, visit AlexanderArms.com or call (540) 639-8356. Editor’s Note: This article is an excerpt from the June 2016 issue of Gun Digest the Magazine.